HUMBOLDT – For centuries, the coastal redwoods and giant sequoias have stood as tightly furled scrolls holding ancient writings inscribed by rain and fog and drought. Today, a group of scientists, with the help of technology, has crafted a way to read those scrolls without destroying them. With the information gathered, the Save the Redwoods League (which is funding the team) hopes to create strategies to protect these living towers from the impact of climate change. 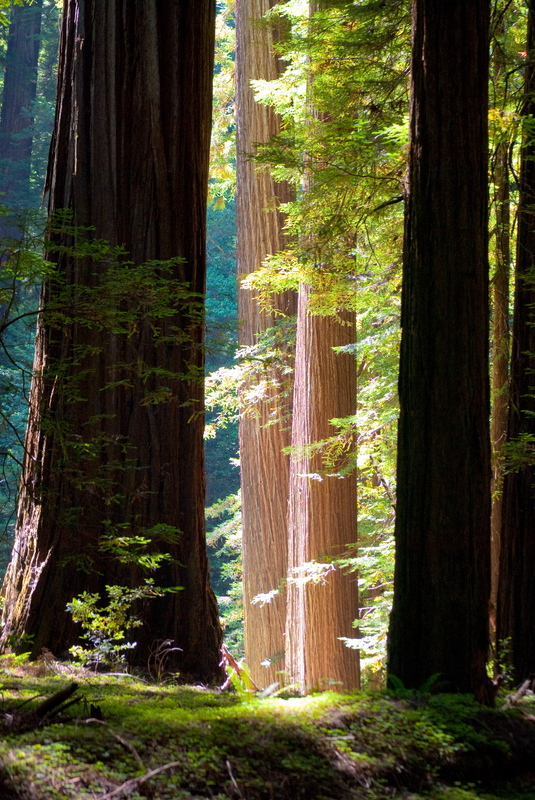 Like the dinosaurs (and at roughly the same time), the redwood forests once ranged across the earth. Recently in historical terms, they dwindled to the western edge of the North American continent. When the ’49ers came to California to mine for gold and stayed to harvest the natural resources, the redwoods around San Francisco fell before the invading armies, leaving barren hills stretching into the distance. The first conservationists who came north were awestruck by the untouched miles of huge redwoods, and responded by creating what has become Humboldt Redwoods State Park. The trees in this forest, long known as some of the tallest in the world, have waited, holding their secrets tightly, until this group of scientists arrived to read the redwoods. 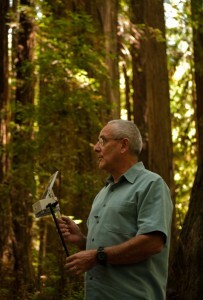 Steve Sillett with the simple tool used to extract samples from redwood trees. The corer is drilled into the tree by turning the blue handle over and over — often hundreds of feet up, suspended from climbing gear. Save the Redwoods League, philanthropists and scientists from UC Berkeley and Humboldt State University have joined together in forming the Redwood and Climate Change Initiative. The idea is to collect a baseline of information using 16 sites throughout the coastal redwood and giant sequoia regions including here in Humboldt. Each site is carefully mapped and studied — not just at the ground level but each tree is mapped and drawn individually from their base to their crown, hundreds of feet in the air. The scientists are exploring these trees thoroughly. 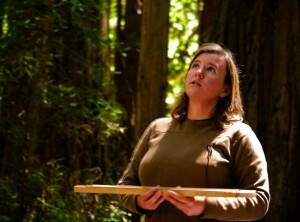 Holding a device which stabilizes the thin cores extracted from redwoods, Allyson Carroll describes how the rings are exposed by sanding and then they are studied for their secrets. The researchers then correlate the information in the rings with known climate conditions in our recent past. Then, according to Ambrose, they use those records in the past “to infer further back in time as far back as these tree rings go” –in some cases inferring climate conditions for thousands of years in the past. And they can do this fairly precisely. They have a tool called a micro mill that lets them take miniscule samples from within each ring allowing them to get a fairly precise understanding of how the trees were functioning and what their climate was like — not just yearly but also within each season! This doesn’t mean the trees are thriving though. They appear to be responding to increased carbon dioxide in the atmosphere. What the team doesn’t know is can the growth rate be sustained? Ambrose worries, “…[I]f temperatures continue to increase to a certain point to where they physiologically can’t tolerate that. Or if fog or rainwater decreases to a point that they become so water stressed that they can’t take advantage of that carbon dioxide, how sustainable [will that growth be? ]” It is also possible that since fog has dropped over 30 percent in the last hundred years, increasing access to sunlight has sped up the trees’ growth. Or it could be a complex interaction of many factors. The team hopes to learn the answers to that over the next few years. 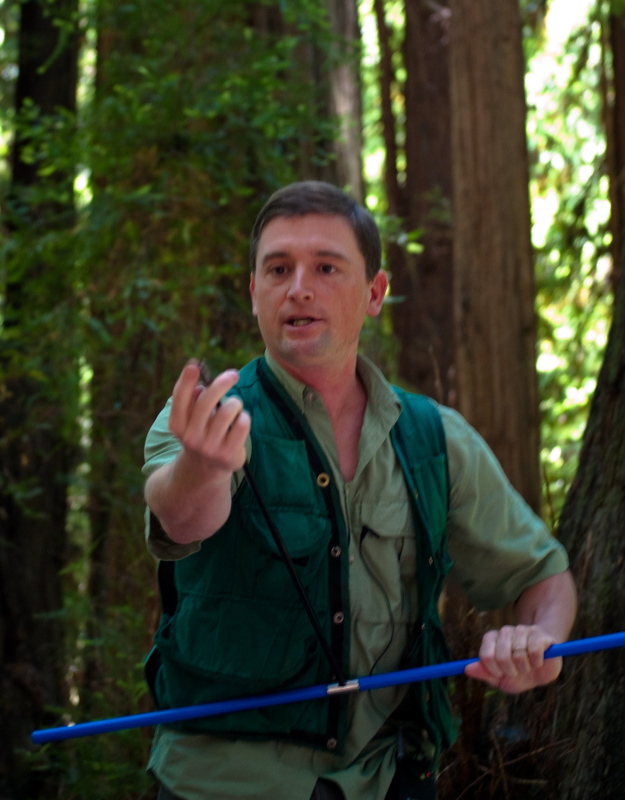 Todd Dawson demonstrates a wireless weather station developed to help the team monitor climate conditions not only on the forest floor but in the canopy as well. With the new data, politicians and conservationists might better understand where redwood trees will best survive the climate changes and where their ranges might disappear. With information such as this, scarce conservation resources could be managed better. If, as Hartley suggested earlier, new climate models show the forests moving to the north and west, then park land can be purchased in areas targeted to most likely contain those future redwoods. The team has been gathering data for almost a year and plans to spend the next two years putting in systems that will allow them to gather even more. They plan to continue to monitor the stations that they have put in for years after that. The data they gather will help them understand how the redwoods are responding to climate change over time. The researchers and the tools they need do not come cheap. The first three years alone are estimated to cost $2.5 million. Luckily, they have some supporters. Save the Redwoods League is, of course, helping to fund the operation. They have raised a quarter of a million dollars. The organization is receiving help as well. Several philanthropists have stepped forward. Kenneth Fisher, who formerly attended HSU as a forestry student and went on to become a financial advisor and author, has created a $500,000 matching grant. The team, scientists, conservationists and philanthropists are looking for interested partners to help them reach their goal of understanding the effects of climate change on our redwoods. Visit savetheredwoods.org for more information. This entry was posted on Friday, August 20th, 2010 at 1:20 pm	and is filed under News, Environment. You can follow any responses to this entry through the RSS 2.0 feed.